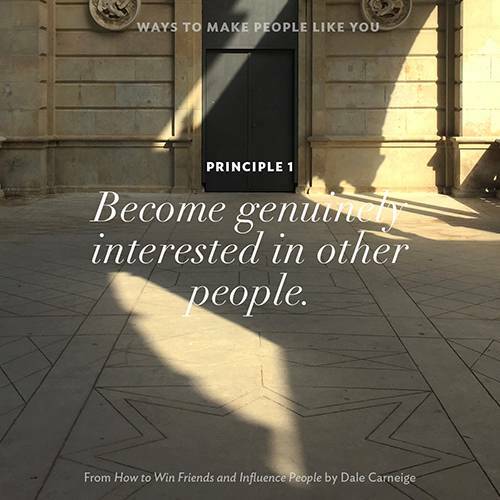 I recently finished Dale Carnegie’s classic How to Win Friends and Influence People. At the core of the book is the importance of empathy and the ability to see things from the perspective of the other person. What I found particularly engrossing about the book were the many detailed and memorable examples of interactions that people have day in and day out where the degree of empathy shapes how we feel and make others feel. The book had my mind racing with all the instances where I ignored, was oblivious to, or dismissed how the other person might have felt, whether it was a stranger, an employee, a client, or a loved one. There’s so much to be gained with a heightened sense of empathy. 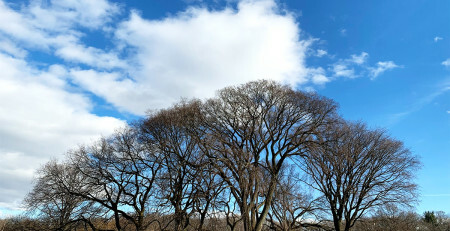 In reflecting on my personal behavior over the years, I could remember the moments when I let the stress of work, the stubbornness of my pride and ego, and a general impatience get the best of me and completely blind me to how the other person might feel about the things I said, the way I said them, and my general demeanor. I let the feeling of shame and regret wash over me, and promised myself that I would do better. To help me remember the lessons of this very amazing book, I spent some time on this snowy weekend creating little graphics with the text of Carnegie’s principles overlaid on top of scenic photos I found on my phone from the past couple years of travel. 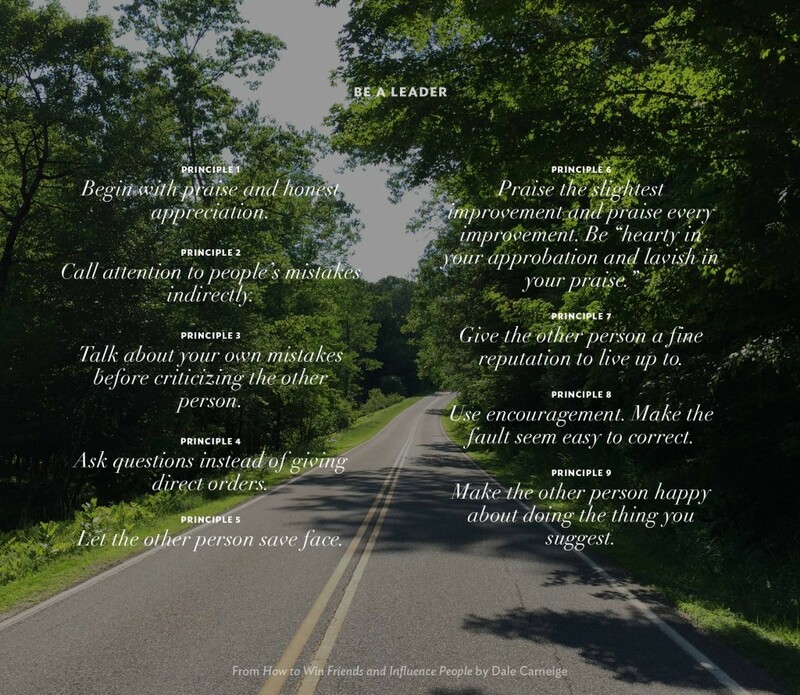 I started out making individual cards for Fundamental Techniques in Handling People and Ways to Make People Like You but ran out of photos, so decided to group the principles under Win People to Your Way of Thinking and Be a Leader into a single larger graphic each. 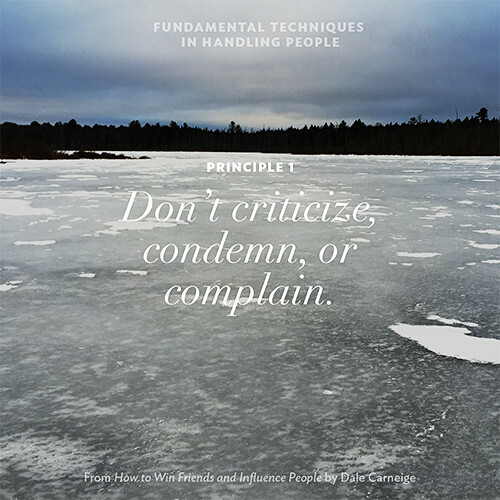 Principle 1: Don’t criticize, condemn, or complain. 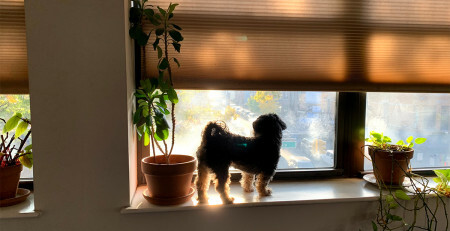 I think about the times when I’m stressed out or overwhelmed, especially at work, and how easy it is to fall into criticizing or condemning someone or complaining about my plights. If I can be better at catching myself or do it in a manner that doesn’t impact anyone else negatively (maybe write it all down to vent), it’ll go a long way in eliminating many misunderstandings and hurt feelings than can happen between myself and others. 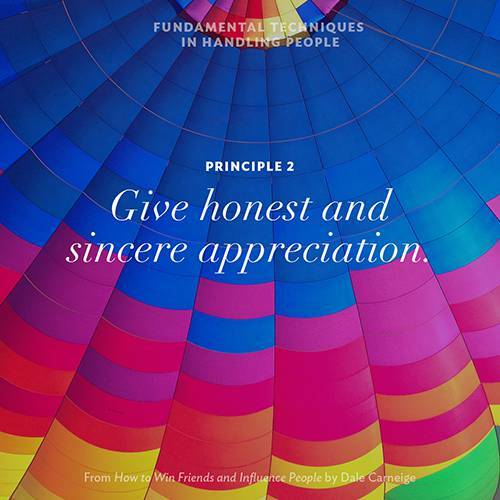 Principle 2: Give honest and sincere appreciation. I think about this a lot because I like to say that my company has built a culture of appreciation, but I know that sincere appreciation is a behavior that needs constant tending. For me, this means being in the know and taking a genuine interest in what people are doing, and then being able to give specific, substantive praise and thanks. The great thing is, when I take the time to see all the things people take pride in and pour their efforts into, it’s very easy to express honest appreciation. Principle 3: Arouse in the other person an eager want. I think back on all the times when I ran my mouth off with stories about myself and failed to ask anything more than cursory questions about the other person. I also know I’ve been a real d-bag when it’s come to thinking that some people are more interesting than others. This is simply not true. Everyone is interesting in their own way, and I believe the onus is on me to show genuine interest and ask engaging questions. I can be better about this, and I know what an awesome impact smiling can have on others. I think about some of my team members and how much of a difference their unceasing smile has on the mood and attitudes of the entire office. 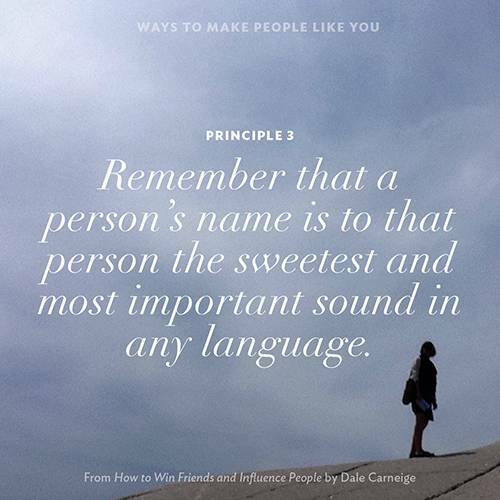 Carnegie tells various detailed stories of people, both famous and not famous, who gained much both personally and professionally because of their ability to recall other people’s names. I realize that when people say “I’m not good with names,” it’s not too different from when people say “I don’t have time.” What they’re really communicating is that they haven’t developed a good system to process, store, and recall names in an efficient and consistent manner. I haven’t developed this as much as I’d like to, but I know that whenever someone remembers my name, especially my full name, it goes a long way in disarming me and making our interactions more pleasant. This goes hand in hand with Principle 1, being genuinely interested in the other person. Listening is the key to so much–better relationships, better leadership, deeper understanding, and stronger connections. 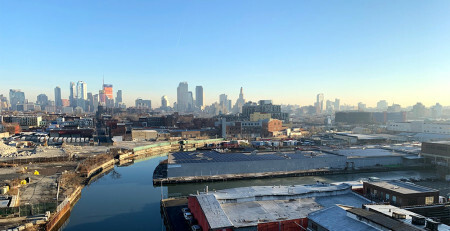 And in the case of my business, being a good listener and getting clients to talk about themselves is a huge asset–the times in which I’ve been able to get the client to do most of the talking, they’ve followed up with compliments on my expertise or knowledge and a desire to continue to the conversation. Again, similar to the principle of “arousing in the other person an eager want”, the smart way to do this is by framing the conversation with the other person’s interests in mind. I really liked the way Carnegie goes into examples of people who take the time to really research and find out about their prospective customers and use the knowledge to start the conversation not about what is being sold but about that person’s interests. I’ve often impatiently dismissed such conversations as “small talk” and jumped straight to the point, but when done artfully, I think the connection you can build with another individual through deep conversation about his or her interests can benefit a potential sale or deal better than any other tactic. 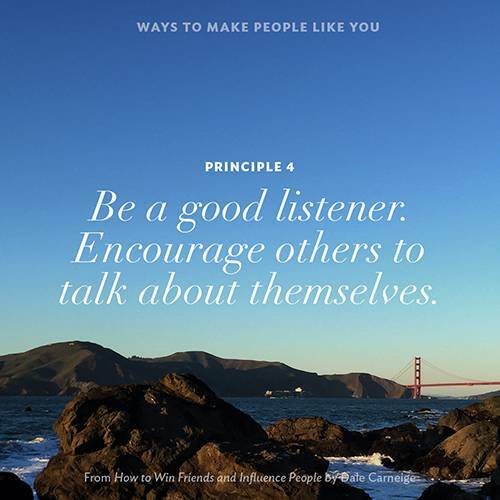 Principle 6: Make the other person feel important—and do it sincerely. This is as important as any of the principles in the book. I thought about how much, both consciously and subconsciously, I craved recognition, appreciation, and acknowledgement. Even a comment like “that’s a solid looking presentation” can go a long way in making me feel good about myself on a given day. I thought about how powerful it could be if I took the time to genuinely express gratitude or to acknowledge the impact someone had on a project or on the team. If I can remember even the smallest compliment given to me in passing, how memorable and deeply felt would genuine recognition go? Principle 3: If you are wrong, admit it quickly and emphatically. Principle 4: Begin in a friendly way. Principle 5: Get the other person saying “yes, yes” immediately. Principle 6: Let the other person do a great deal of the talking. 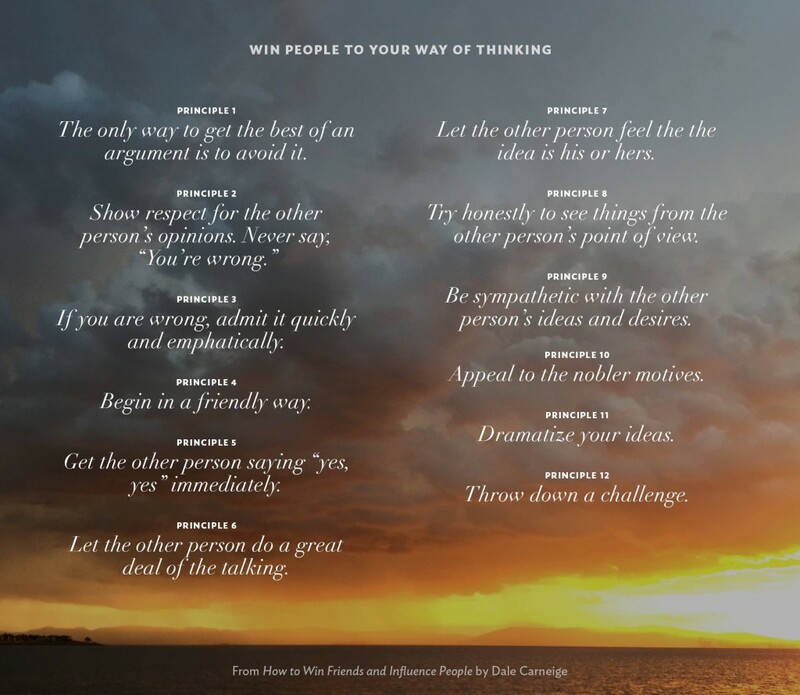 Principle 7: Let the other person feel the the idea is his or hers. Principle 8: Try honestly to see things from the other person’s point of view. 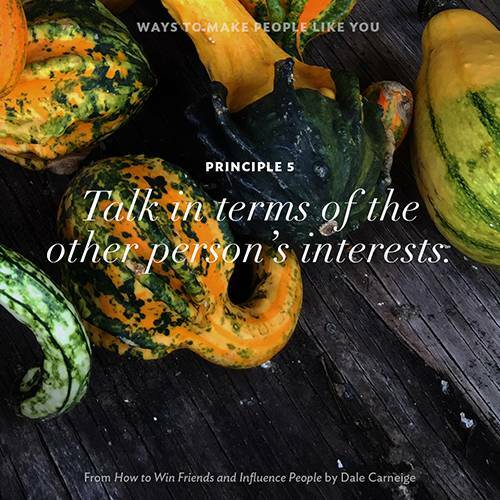 Principle 9: Be sympathetic with the other person’s ideas and desires. Principle 10: Appeal to the nobler motives. Principle 11: Dramatize your ideas. Principle 12: Throw down a challenge. Speaking of pride and ego, I’ve also done my fair share of claiming credit for ideas, often going out of my way to let people know, “Yeah, that was all from me.” What a great way to disengage and turn people off to the very idea! I’m working on this, and hope I can be more gracious, expending my energies to give credit to others. A leader’s job often includes changing your people’s attitudes and behavior. 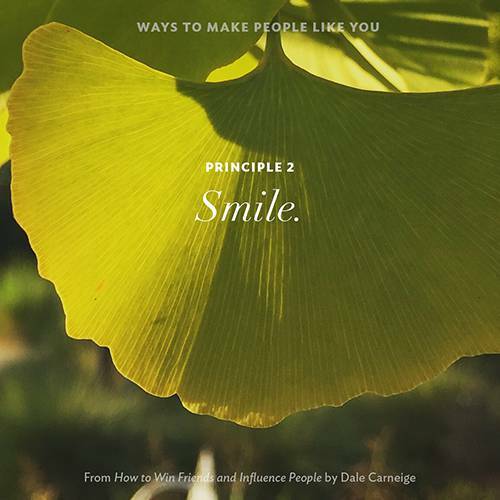 Principle 9: Make the other person happy about doing the thing you suggest. Two big takeaways from these principles were A) the way to engage people when giving them critical feedback and B) the power of encouragement. I’ve been a big proponent of hiring people who can “take feedback.” I’ve found myself saying this a bunch of times: “We like team members who’re great a taking feedback.” But I don’t think I ever gave much thought to the feedback itself and how it’s delivered. When feedback comes in the form of an accusation or harsh criticism, it’s bound to raise the recipient’s guard and trigger a defensive response. I don’t care how much you call yourself a “straight shooter” or a “straightforward” talker–there’s a level of decency and kindness that has to be maintained in every interaction. I know this from personal experience: I’ve given such “straightforward” feedback only to hurt people’s feelings and get nowhere, even when I had the “best of intentions.” Feedback is only useful if it’s well-received and actionable. I’m learning that feedback is most effectively delivered in a gentle manner, in a way that keeps the recipient’s pride and dignity intact, and with some kind of recognition, acknowledgement, or encouragement that makes it clear that I trust the recipient will take the steps to do what’s best for the team. I’ll end my thoughts on How to Win Friends and Influence People with my thoughts on the power of encouragement. I remember when I was a freshman in high school. I was taking a final exam for history class. Coincidentally, one of my football coaches was the proctor. While I took the test, he spent the time writing me a letter. At the end of class, he handed it to me and wished me a good summer break. In the note, which I’ve still kept all these years, he told me that he saw a great deal of potential, and that he could see me contributing to the varsity team as a sophomore. He told me that I would need to work hard and hit the weight room, and that if I really wanted it, it was within the realm of possible. This was encouragement that I never forgot. I remember later that summer, I started hitting the weight room every single day, an hour before we were supposed to get there. I remember hitting the track at noon on a summer day and doing 100 meter and 200 meter sprints. I ended up getting a varsity letter as a sophomore and played a good deal of special teams and even scored a TD in a clean-up role. The encouragement was priceless, and I didn’t want to let my coach down. It didn’t take him a very long time to write the letter, and yet, it shaped so much of what I did for the next 6 months. As I continue my pursuit of developing as a better leader, I hope I can be a source of encouragement and inspiration for those around me. This is an awesome post on a really important book. Really found the letter anecdote at the end to be inspirational. Thanks, Betty! Appreciate the encouragement, and it’s been a pleasure making progress on the business with you every week!